The new bike box: What do you think so far? The bike box at SE Hawthorne and 7th in action. Portland’s new bike box has been in action for just about 24 hours. From my observations, the initial performance has been very promising. The vast majority of cars stop well behind the box and I’ve only seen a few folks turn right on red. KATU-TV crews spent an hour watching the intersection yesterday and found pretty much the same thing. Check out there bike box story and video that ran on the evening news last night. Laszlo went on to write that he fears, at least initially, “people (both drivers and cyclists) will fail to understand how these things are supposed to work” and that she’s more concerned about bike boxes when traffic is moving. I’d love to hear more from you. Whether you ride a bike through it or drive a car through it…what are your thoughts so far? I rode through it yesterday around 6pm with a green light, i.e., I didn\’t stop. I did as I always do at that intersection and countless others like it where a right-hook is possible, I looked over my left shoulder to see if a motor vehicle was close to me in the adjacent lane. I thought that the green added a level of salience for motor vehicle operators who otherwise might not check for a cyclist on their right prior to turning right. At least I hope so. shouldn\’t the box extend across all 3 lanes? To answer Paul, at that intersection YES. Its a one-way crossed by a two-way and many cyclists are in the left lane turning left there. The green on the right may distract drivers from looking for bikes on the left (but did you see the moonwalking bear…). I thought it was going to as well, Paul (2). It would be nice for those of us who do make that 3-lane switch. Would definitely help when you\’re stopped at that red. I pedaled through it last night as well along with a green light (didn\’t stop). I really like the green paint – very visible – and hope that the same will be used at other important intersections (i.e. The lane at the top of Hawthorne bridge before heading down). It would be nice to have the East-Bound bike lane onto the Hawthorne bridge painted through. I see that almost no cars notice that there\’s a different \”STOP\” line that isn\’t the line outlining the edge of the bike lane. Cars never stop at the first – they roll forward (probably not noticing the aging and fading line) and nose into the bike lane, making coming onto the bridge heading East dangerous and sometimes scary. I rode it yesterday and felt like I was a bit safer. Of course, that\’s up to me and my neighboring automobiles, more than anything. i guess i\’m confused how this box works for people turning left. if it doesn\’t go all the way across, you still have 2 more lanes of traffic to cross during the next blocks or so, right? so getting in the bike box will make you more visible to cars so that you can make this transition easier? in the picture jonathan has for this story, you can see a cyclist at the far left of the intersection. how does the bike box benefit that person? i\’m not dissing the box, i\’m just trying to understand it. ps. i like the color! I haven\’t pedaled through it yet but my question is whether or not the paint, when wet, becomes slippery. Folks, please understand that the bike box is not some magical thing that solves every bike safety problem at an intersection. Like I mentioned previously, the bike box at Hawthorne and 7th is not meant to facilitate a left turn in any way, shape or form. I do know that PDOT considered making it go across all three lanes at one point, but they (for a reason I can\’t recall right now) decided against that treatment. I\’m sure Roger Geller has a good explanation. Also, I know PDOT is currently thinking about the left-turn situation on intersections like this and I\’m sure someday we\’ll see additional markings and a solution. Thanks, Jonathan. BTW, I\’m a he. I do like the increased visibility of the green paint, and I think bike boxes can improve safety in appropriate locations. One spot I would like to see one, and I think it may be planned is northbound on SE 21st at Division. I always take the lane when turning left there, and it would be nice to be up front. I see a lot of cyclists turn left from the bike lane on to Division, only to be crossed by right turning cars as the bike continues on to Ladd. Very unsafe. Jonathan is right. When the light is green, operations do not change for any vehicles — bikes or motor vehicles. For a left turn, either make a vehicular left or an \”l-turn\” style left. Basic message, on green do not change the way you use the street. The real benefit on green is that it heightens the awareness of motorists to look for bicyclists. There are basically four different ways that bike boxes can be used. 1) Highlighting presence of bicyclists and reducing the risk of right or left hook crashes. This is the purpose of the box at 7th/Hawthorne and almost all of the other boxes that will be installed. With this type of facility, all vehicles should use the street just as they always have when the light is green. The facility has primary effect when the signal is red. When the signal is green, it\’s main effect is to heighten the awareness of motorists to the presence of bicyclists. When the signal is red, it heightens the visibility of cyclists and reduced the risk of right hook crashes. 2) Turn to opposite side of street. There are a couple of approaches to this. New York City has more than 60 bike boxes installed, many that assist cyclists in making a right turn from left-side bike lanes. Vancouver, BC uses a series of 2 bike boxes to assist with an \”L-turn\” style left turn. There is nothing that precludes the current bike boxes from assisting with left turns in the future with some design updates. However, we are currently evaluating and operating them based on effect #1 listed above. 3) On bicycle boulevards, like at 39th and Clinton, they are used to provide priority to bicycles at signals. 4) They can also be used to smooth operations between high volumes of cyclists and other modes. Basically, in this type of case, multiple cyclists would congregate in the box on a red signal. When the signal turned green, they would go through the intersection first to clear the intersection much faster and more visibly than if the bike box were not present. I forgot to add that I think the No Turn on Red sign may be hard to notice. I think there should be another one up by the light. \”… Like I mentioned previously, the bike box at Hawthorne and 7th is not meant to facilitate a left turn in any way, shape or form.\” So its primary purpose to protect cyclists going straight from a right hook? Should a lone cyclist going straight move over into the box or stay in the bike lane? I assumed the latter, but now I\’m not sure. For left turns–I would think if you came to the box using the bike lane, by the time you moved yourself all the way to the far left lane the light could turn green before you made it. Cars in the left lane would have no idea you\’re coming over there. You\’ve got to treat left turns as always, get over there sooner like regular traffic. NO!!! If you get in the box & try to make a left from there across 2 lanes of traffic, you won\’t answer to traffic law, you will answer to Darwin\’s Law. To properly make a vehicular left turn at this intersection you have to start moving across motorized lanes way back BEFORE the intersection. It would be best to take the CENTER of the leftmost lane so cars can\’t attempt to pass you while you are in that lane. The bike lane and bike box should be used only by those wishing to go straight or turn right. During rush hours when heavy traffic makes it difficult to maneuver across lanes it is probably best to do a 2-corner left turn at this intersection. I could make diagrams of the proper ways to make various turns this intersection if Jonathan wants to post them, but without assurance that they\’ll be put up, I\’m not going to waste my time. That\’s completely up to you. Either way, your visibility increases dramatically with the bike box. Even if you stay in the bike lane (and don\’t move over into the box), the car is not stopped 14 feet behind you instead of directly to your left. I assume that at an intersection with more stopped bike traffic, people will naturally move over into the bike box when/if someone is already in the bike lane in front of them. As with any traffic design, there are always issues on the ground that engineers have to respond to. We have design standards, but the world is not standard. For example, in this case, we agree that the NO RIGHT TURN ON RED would be preferred to be next to the signal. The problem with this at 7th is that the signal is on old span wire. The condition of the signal makes it so that we can\’t put additional wind load on it. Other challenges at this location is that there are a lot of other signs and narrow, congested sidewalks. So, the engineers found the best place they could for the sign. I\’d expect that in the future, when the signal is replaced (approx. $150,000), that the sign would be on the new mast arm. Unfortunately, it\’s impossible to know when the signal will be replaced. I feel that the bike box at that particular location does little to actually improve the safety of that intersection. It does however provide a very high car traffic area exposure to the idea of the bike box, so they might have a clue when dealing with intersections that could benefit from them (21 and division is a good one). I really can\’t see ever using the section of the bike box that puts you in front of traffic on Hawthorne at this location because if I am going straight, I will just stay in the bike lane, and if i am turning right I\’m going to take it from the bike lane. At this location it almost seems like the box area itself is more useful as a means to keep an automobile back and the bike more visible. I\’m not sure I could see myself getting in front of traffic to go straight either. Okay, now I\’m going to shut up and go ride it before I say anymore. If you\’re like me, the bike box is a good place to get in front of the slow moving cyclists who arrived before you. But I agree with others that the left turn onto 7th is tough, and not addressed at all by the box. Unless there\’s not much traffic, I prefer to avoid that turn entirely by heading a couple blocks up the esplanade from the bridge. If the box extended across all the lanes, or if there was a separate bike signal for that turn, that would be ideal. The bike box looks great – I can\’t wait to use it. Wonderful idea. As I read these comments, it is clear that some informational meetings for bicyclists (with traffic engineers present) would be a good idea. For example, I already thought of one tricky situation. On a red, as I ride forward to the bike box, I would want to move towards the middle directly in front of the stopped car in order to be most visible. However, if the signal changes to green just as I pull up at a moderate speed next to the stopped car (so that I am more or less in their blind spot until a split second before they move), planning to move as I state above would put me in severe danger of being hit, even if they were going straight. I\’m not trying to knock the bike box. I just would like some advice about how to navigate most safely. For example, in the case above, is it good advice to stay right until having reached the front of the bike box (to insure being visible) and then move to the center to be even more visible? A meeting with those who have gotten traffic info/data from other cities would be great to help us all get answers to our questions in order to better understand how to stay within our individual safety comfort zones. As previously mentioned, I think the bike box will be of most benefit with multiple cyclists having to stop at once, rather than having to line up single file in the bike lane and take chances with motorist awareness (or lack thereof). It\’s great! Glad to see these being installed. What\’s interesting is the *reason* they are being used as a tool. When I travelled in Europe a few years ago, one of the first things I noticed is that America is one of the few countries I know of that permits right turn on red. In many European countries, this is simply **unheard of**. Europe didn\’t have a lot of the kind of three-lane arterials we see here in America, so their bike boxes fuctioned really well, because they seemed to be primarily installed on roads with one lane of traffic in each direction. It\’d be interesting to see how a bike box on a street with three lanes of traffic one direction works out. I\’d rather see the bike box extend across all three lanes, given that their purpose traditionally has not been to prevent right hooks, as much as to facilitate left hand turns. But we\’ll see! I\’ll join the few, proud yahoos that haven\’t actually seen it but have a question anyway. I understand that I can turn right on red even though cars can\’t. Does the signage say (except bikes)? Ideally, the cyclist in the picture would have stopped two feet back to avoid blocking the crosswalk. How much room do people need? It\’s not like the bike box is full of cyclists, or he needs to be there to maintain visibility. Consideration goes both ways. Do we like it when cars block the bike lane? My guess is that bike boxes will be perceived as working well until the first time an impaired or otherwise inattentive driver slams into a group of cyclists gathered in one as they wait for a green light. Good Lord, sounds like confusion to me. If it takes more than two sentences to explain, then its stupid. KISS is suppose to mean: Keep it simple, stupid. not Keep it stupid, simple. Green? Dude in a car that means GO. A green no turn on red sign? How about drivers just be observant, and know their surroundings. Actually, shouldn\’t the cyclist be in the box? There should be an island (http://bikeportland.org/2008/03/18/a-green-street-made-safer-with-new-markings/) that stops the parking lane so it will never be confused with a lane of travel. The other thing is that I\’ve heard that the No Turn On Right signs are difficult to see. They should be right next to the traffic signal just like they are at other intersections. Bike box doesn\’t have to be synonymous with \”No Turn On Red\”, there just needs to be clear signage that that particular intersection is a No Turn On Red intersection. Will a bike box help a cyclist make a left hand turn? It sounds like from this story that it doesn\’t make left hand turns any easier (if the bike box is only in the rightmost lane). If a bike box were to extend all the way across to the left lane, then I suppose a cyclist could ride in the bike lane and then walk over to the left most lane. I guess this isn\’t the case, as the cyclist in this article got pulled over. Will there be some sort of formal process for the city to field comments regarding the bike boxes? Or just pen a letter to Roger Geller?? I turn left on 7th from Hawthorne regularly. If traffic is low, I drift left between MLK and 7th before turning. If traffic is heavy, I bike into the crosswalk and into the bike lane on 7th, manually turn left 90 degrees, and continue on 7th when the light changes. I otherwise wouldn\’t be stopping at 7th. The lights are timed so that bike traffic stops at MLK and continues on through 7th before the next light change. The *actual* hazard which a bike box could fix is protection from the buses stopped at MLK. They wants to squish the bikes while trying to make the bus stop at 6th. I just want all of you to know that the bike boxes and colored bike lanes that Portland is installing are UNAPPROVED TRAFFIC CONTROL DEVICES. 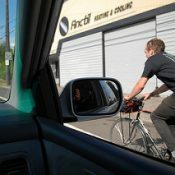 As it turns out, the reason that Portland thinks it needs bike boxes in the first place is to prevent right-hook accidents, but did you know that the right-hook accidents are happening because Oregon has chosen not to follow national guidelines for bike lane laws and for marking bike lanes in the first place? Now, people who work in the Portland Office of Transportation disagree with that statement. Apparently, they want to re-open the debate on the national guidelines. In fact, there are procedures in place to do that. Instead, Portland has chosen not to follow those procedures and instead simply barge ahead and install the bike boxes and colored bike lanes. So, Portland bicyclists, the City of Portland is playing with your lives. If one of you gets hurt at an intersection with a bike box, it will be interesting to see how the City tries to defend itself against knowingly installing unapproved traffic control devices. Just so you know, I live and work in California and helped develop the guidelines for the way bike lanes work back in the 1970\’s. I care about what is happening in Portland because, if the City of Portland is successful at changing national guidelines on bike lanes, it will hurt bicyclists everywhere in the country, including me. I\’ve been wondering when/if you would post on this topic. PDOT is not afraid to admit that they willingly innovate beyond what the Federal standards are for traffic engineering. 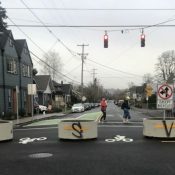 As a result of their commitment to design streets for the behavior they would like to see, rather than by what the Feds \”allow\” them to do, Portland has the highest rate of bike use for any American city, a decreasing bike crash rate, and we\’re the only major metropolitan area that has reduced VMT year over year. In my opinion, it\’s the FHWA and their outdated standards that are \”playing with our lives\” by continuing to favor motor vehicle traffic over bikes, peds, and mass transit. I have read Portland\’s bike box application and I have read your letter in opposition to it. I have also talked to the author of Portland\’s letter, Roger Geller. According to Roger, \”requesting permission to experiment\” is more of an engineering formality and it is not a requisite thing city\’s must do. 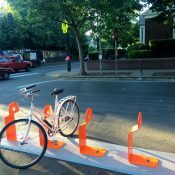 Portland is not running afoul of any laws, or putting people\’s lives in danger by doing this bike box pilot project. The bike box relies on a traffic control device that is already approved and will be enforced by the Police — it\’s called a stop bar… the same thing already used in pedestrian crosswalks. 810.200 Uniform standards for traffic control devices; uniform system of marking and signing highways. (a) The commission shall adopt a manual and specifications of uniform standards for traffic control devices consistent with the provisions of the vehicle code for use upon highways in this state. (b) The commission is authorized to provide a uniform system of marking and signing highways within the boundaries of this state. (c) The commission is authorized to determine the character or type of traffic control devices to be used in this state. (a) The system of marking and signing established under this section shall correlate with and, as far as possible, conform to the system adopted in other states. The commission may include in the system signs and signals that show internationally recognized and approved symbols. (b) So far as practicable, all traffic control devices in this state shall be uniform as to type and location. (c) All traffic control devices placed or operated in this state shall conform to specifications approved by the commission. Are you saying that Portland is not subject to this law? When Portland applied to FHWA for permission to experiment, it stated that bike boxes were not in the national Manual on Uniform Traffic Control Devices (MUTCD). Now they\’re saying that the advanced stop line is already approved. They can\’t have it both ways. To answer your the second part of your question, my answer is what I learned on one of my first organized rides: \”Never pass a right turning car on the right.\” Any bicyclist who places him/herself on the right side of a right turning car is setting him/herself up for a right-hook. To avoid being right-hooked, bicyclists must ALWAYS pass cars that may turn right on the LEFT side. And motorists must ALWAYS turn right from as far to the right as practicable, even if it means merging into the bike lane. That is what is written into the national guidelines. Is that favoring motor vehicle traffic over bikes, peds and mass transit? I think not. First, please understand that my thoughts are my own and that I have absolutely no affiliation with PDOT whatsoever. Again, I have little respect for national guidelines that have produced a bike mode split of less than 1% nationwide. I have trouble understanding why Portland should conform to standards that are clearly not helping encourage more people to ride bikes. Some cities design their bikeways according to what federal guidelines tell them. Two different philosophies at work here… and my main point is still that the proof is in the pudding. Portland bike mode split is skyrocketing and the rate of bike crashes is falling. So please tell me why PDOT should stop what they\’re doing? I\’m proud to live in a city that is not afraid to innovate in the name of getting more people (safely and comfortably) on bikes. Interesting that Bob S points out that these bike boxes are UNAPPROVED TRAFFIC CONTROL DEVICES, yet the city is installing them anyway. Because the Rob Burchfield, the city Traffic Engineer, has been claiming for over ten years now that the city cannot install Sharrows markings because they are UNAPPROVED TRAFFIC CONTROL DEVICES. IMO, sharrows would do a lot more for making motorists recognize and understand where cyclists are allowed to operate in a shared lane situation than these bike boxes ever will. The bike boxes are confusing and marginally useful at best. I have always questioned the way in which Portland implemented bike lanes at intersections forcing vehicles to turn across a through lane. I always felt it was an unsafe way to engineer traffic. Thanks for pointing out what should be an obvious lack of safety in the current design implement by the City of Protland. BTW, thank you, Mr. Shanteau, for speaking out against this idiocy. I think that sums up my feelings on the matter. Other than bike lanes on the right side of the road, what are the options? Sharrow? sure if you are a fit biker who likes to play in traffic. (I do, but that is not everyone)? Bike lane in the middle of the road? That works as long as no MV ever tries to change lanes, and would not increase bike usage. Banning Right turns by MVs? That works for me when I bike, not so much when I drive. How about drivers using their turn signals, being aware, bikers slowing down and being aware when they pass through intersections and bike lanes? I love sharrows. I love bike boxes. I love taking the lane. I love defensive, \”vehicular cycling\”. I love cycling and I want as many Americans as possible to do it more often. Right now, about 1% (if that) of Americans ride bikes on a regular basis for transportation. There are many possible roads we can take to improve that number. Getting bogged down in defending our personal beliefs about bikeway design and trying to drag down people who have their hearts and minds in the right place, and are not afraid to do something about it, is not the best way forward. Debate and dialogue is great… but turning it into negativity hurts us more than it helps us. The real victory in this \”battle\” should be measured in how many people ride bikes, not in whose bike facility design philosophy wins out. PDOT has chosen one particular philosophy based on what I think is very sound judgment. They\’ve looked outside of America for examples that have proven to work, they have engineers that really \”get\” how to create a safe and comfortable bikeway network, and most importantly they have a host of stats that prove they are on the right track. I am still waiting to be convinced by the vehicular cycling, \”take the lane and we\’d be better off…\”we don\’t need no stinkin\’ bike boxes\” crowd, that their vision of a world-class bike city would actually be a place where the 60% of Portlanders that are currently \”interested but concerned\” in riding would join us. Trying to integrate bikes and cars is simply never going to result in significant (30%+) bike mode share. Jonathan – PDOT engineers don\’t get how to create a safe and comfortable bikeway network if they are still building bike lanes in the door zone or to the right of lanes with high volumes of right turning traffic, with or without the addition of bike boxes. It is also a fallacy to state that the only other option is vehicular cycling without any bike lanes at all. It is very simple to build a properly destination-positioned bike lane to the left of a right-turn only lane, and PDOT has done it many times in the past. Trying to completely separate bike and motor vehicle traffic on the narrow streets of the inner Portland grid system is never going to happen because the space just isn\’t available to do it. You said: It is very simple to build a properly destination-positioned bike lane to the left of a right-turn only lane. No it isn\’t. It it were, we\’d do it. Such designs require significantly more real estate in the roadway then we currently have available to us. Or, we\’d have to remove a lot of on-street parking on those blocks, which is currently politically untenable in the central city. Not to get too technical, but a right-turn add lane (which requires a lot of roadway) is much more preferable than a right-turn drop lane. The first is exemplified by the south bound intersection at Vancouver and Russell. The second is exemplified by the roadway at NE Broadway between 1st Victoria. Check them out. In the first one the bike lane stays whole. In the second one the bike lane drops and cyclists must cross the travel lane. From what I know after listening to PDOT talk about this stuff a lot is that they no longer prefer bike lanes in the door zone … however, I think they still prefer bike lanes over nothing at all. As for how they design the bike lanes…. The problem I have heard expressed by Roger Geller from PDOT is that moving the bike lane to the left does not eliminate the potential for a collision, it simply moves it back before the intersection…. but I shouldn\’t speak for PDOT and this is getting into technical design territory that I am far from an expert on. An right turn only lane could easily have been added at SW Everett and 16th if the curb extension hadn\’t been installed there first. Same goes for SE Hawthorne and 11th. Same goes for SE Hawthorne and 7th, there is no curb extension there at present. It could have been done at SW 14th and Burnside also. Really, all that is required to add a right turn only lane in all of these places is to remove a few curbside parking spots and a curb extension or two. And if PDOT \’prefers bike lanes over nothing at all\’, then they should be all for installing sharrows on streets that are too narrow to add bike lanes to, like E 28 from Stark to Broadway, why haven\’t we seen this done yet? BURR, my apologies.. but I have deleted some of my previous comment (that you refer to above) precisely because I don\’t want you to think I am somehow speaking for PDOT. Again, I will be careful to try and let PDOT defend and explain their philosophies and design principles themselves. You said: The bike boxes are confusing and marginally useful at best. Based on what study? PDOT is going to be evaluating the effectiveness of these bike boxes with PSU\’s Initiative for Bicycle and Pedestrian Innovation and researchers from PSU\’s Center for Transportation Studies. We collected extensive before data and we\’ll collect extensive after data, both at the bike box locations and at 7 control (untreated) locations. Then we\’ll find out how confusing or useful they are. Our expectation of course is that they\’ll be quite useful. Already motorists are almost universally complying with the stop bar in front of the bike box. That\’s almost unheard of for any type of new traffic control–even conventional traffic control applied in a new location. Motorists don\’t appear to find it confusing. The cyclists I\’ve seen using it don\’t appear to find it confusing. Who\’s confused? the measure of success for the bike boxes should be a reduction in the number of right hook accidents at these locations, not whether cars stop behind the line or not. How good are the \’before\’ stats on right hook crashes at these locations, and what is being done to collect good stats on right hook crashes after installation? We\’ll also look at the crash histories at each intersection both before and after installation. If you read the last link Dr. Shanteau posted, you will see that I have been working with him and have been in contact with PDOT and Robert Burchfield. I attended the informational meeting on Thursday as well, and had planned on speaking out against the implementation of the bike boxes, but decided not to feed myself to the wolves as it appears they have near-unanimous support. So I will post my comments here. The first thing I will say is that although I disagree with bike boxes and don\’t plan on using them, I will concede them (if everyone really wants them) if they are approved TCDs, properly tested and actually can be shown to effectively mitigate \”right-hook\” accidents (I already suggested to Mr. Burchfield to consider RTOLs with bike lanes to the left just to show that I\’m not an anti-bike lane zealot). None of these points has been demonstrated to be true. Although Mr. Geller in post #57 states that the boxes will be tested, the experiment design is flawed (Mr. Shanteau and myself have already repeatedly pointed this out) as the control group is improperly set. It also fails (so far as I know) to separate confounding variables (such as the sole mitigatory effect on right-hooks of prohibiting right turns on red). The evaluation criteria (at least in my opinion) is of questionable significance. In it\’s current design, there is no way to determine what effect the box has on mitigating right-hooks or other traffic conflicts. That\’s simply a bad experiment, my engineering statistics professor in school would have flunked me for an experiment design like this. To make my intentions clear, I will emphasize that my interest in speaking out against this is with the welfare of cyclists. I\’m a little dismayed when I see this discussion diverted towards our overall accident trend or about encouraging cycling; that is not the subject of this debate. We are debating a specific (unapproved) TCD that is supposed to mitigate a specific accident that took the lives of two cyclists this past October. Such a TCD should be carefully evaluated and properly approved, I would hope any cyclist would expect this kind of engineering attention, especially in light of the October tragedies. I wish that that were the case, but the evidence speaks for itself: these are unapproved TCDs, the evaluation experiment is flawed, PDOT has not conformed with engineering law OAR 820-040-0030 and resubmitted it\’s FHWA RTE signed by a licensed traffic engineer (namely Robert Burchfield), there is no evidence that a licensed engineer designed the experiment (which might explain it\’s flawed nature; I repeatedly asked Mr. Burchfield this question and received no answer). No matter what anyone\’s individual opinions are about these matters, consider the reasons for engineering law and FHWA approval procedures: they are designed to protect the safety of the public but ensuring conformance to strict standards of safety and design. Just like I can\’t start doing open-heart surgery in my garage (even though I may have some revolutionary new way of doing it and I say I know what I\’m doing) without a physician\’s license, persons without traffic engineering licensing cannot make roadway design changes, and especially not without proper approval. This analogy is not as far-fetched as some might think; roadway design is concerned with the safety (and thus preserving the lives) of those that use the road; being vulnerable road users, I\’d say this aspect is even more important. On the subject of vehicular cycling (and also with regards to the bike boxes), I welcome anyone to look into Oregon\’s bicycle laws (specifically the mandatory bike lane law); on a road with a bike lane stripe, vehicular cycling (that is, cycling according to the normal vehicular traffic laws, the best way to minimize traffic conflicts) is mostly prohibited. The better bike lane laws (such as California\’s) are a rephrasing of the as-far-right-as-practicable law, so they allow (although the stripe discourages) the movements of cyclists and motorists that allow each party to properly position themselves at intersections and for relative speed (namely cyclist through movements and motorist right turns). I discovered this recently and was stunned. Basically Oregon bike lane law requires movements that conflict with the vehicular rules of the road with no exceptions (including motorist right turns; they are required to stay out of the \”sacred\” bike lane, then swerve across it to turn right; this is very different from merging and then turning, specifically in it\’s ability to be done safely). That includes requiring using facilities like these bike boxes and blue bike lanes, passing slower motor vehicles on the right when they are able to turn right (very dangerous) and riding next to parked cars (even on downhills!). I do none of these things, merely to preserve my life (I ride in downtown everyday, so I\’m apparently breaking the law quite a bit). It is unfortunately illegal. Consider these points before the next state legislative session, hopefully the BTA will lobby for changes in this law (I certainly hope so). To all of you using the bike boxes, please be careful. My own exp (as an avid cyclist with good lights and pretty decent hanndling skills) is that RTOL w/ bike lanes on the Left are dangerous because drivers will always agressively compete with bikes- on Broadway coming towards the steel bridge I have had cars race to get a head of me when I am going the speed of traffic. To me the bike box seems (and yes this is anecdotal…) to slow everything down, and civilize the whole process. Well, seems the discussion has died, don\’t know what everyone who has read this is thinking. If you want to contact me for more information, my e-mail address is ryanridesabike(_at_)yahoo.com. Only serious inquires please. Ny final opinion is that the educational component associated with this project is a plus, but that the actual design of the \’improvement\’ still leaves a lot to be desired. Ryan, I just read your comments. You raise some interesting points. Are you a licensed traffic engineer? You seem very knowledgable of such matters. I am not an engineer, but I have had the help of knowledgeable engineers and have familiarized myself with some aspects of engineering law and some of the basics of traffic engineering. That\’s as far as I\’ll go with explaining about what I do and do not know, as I don\’t want this to become a debate of credentials. I have presented some valid concerns and questions, none of which have been addressed or answered. Installing an unapproved TCD opens the City of Portland up for potential injury liability lawsuits if an accident occurs. Anyone injured in a car-bike collision likely has significant legal leverage to mount a successful lawsuit against the city if they choose to do so. This should be no secret; it should be an obvious consequence of PDOT not conforming to standard procedures for RTE submissions to the FHWA, not conforming to Oregon engineering law by resubmitting their RTE signed by Burchfield, and not following AASHTO guidance for the design of bike lanes in the first place (namely striping them straight up to the intersection; AASHTO guidance calls for dashing or deleting the stripe at major intersections to encourage proper destination positioning of cyclists and motorists at intersections). Although AASHTO guidelines are just that (as Burchfield rather condescendingly pointed out to me) and can be disregarded, evidence of sound engineering judgement or a study must be presented as justification for deviating from these standards if you\’re an engineer that pays attention to ethical conduct of your profession. You can\’t just deviate because \”you feel like it\”. The fact that the installation was apparently rushed in without any approval and PDOT failed to resubmit it\’s RTE per the request of FHWA to clarify safety concerns and the experimental design (it\’s been over a month now) is very disturbing to me. Why did they do this? I won\’t comment on that, but I think all of you should be questioning this if you value your safety. This conduct in inexcusable in my opinion. So Ryan, do you have any opinion why Burchfield is so eager to disregard the guidelines and standards in this case, but not in the case of sharrows markings? The issue of sharrows is new information to me, I don\’t know Burchfield\’s reason for favoring bike boxes over them (basically one unapproved TCD over another). Not knowing very many details, I can\’t form an accurate opinion, but it is interesting. Although I\’m somewhat indifferent to sharrows (the road is the bicycle facility in my opinion, despite Oregon\’s discriminatory laws, so sharrows are kind of an unnecessary reminder that I\’m \”allowed\” to use the roadway), they are substantially better than bike lane stripes and bike boxes because I don\’t have to break bicycle-specific laws to follow normal vehicular traffic laws or to avoid bike lanes with intrinsic hazards (such as \”door-zone\” bike lanes, I\’m not going to risk hitting a car door and getting killed or put in a wheelchair for the rest of my life, such as on that downhill one on Everett that then transitions to a blue bike lane over the I-405 overpass….suicide). The only sharrows I\’ve seen are in NW (between Everett and Flanders I think, 18th or 19th street? Can\’t remember.). Although they are also unapproved TCDs, I\’d argue their striping is far less controversial to the unapproved nature of bike boxes, because sharrows don\’t specify any particular method of riding, and certainly don\’t contradict the standard rules of the road. Bike boxes do this (and severely at that), so they must be carefully designed, which gives even more reason (IMO) to get proper approval and test them properly. The fact that PDOT has done none of these things is what so greatly concerns me. The background on sharrows is that the small distance of sharrows on NW 19th is the \’test\’ section, and has been for about the last five years. Burchfield has been resisting the more widespread use of sharrows for at least the last ten years for the same reasons you say he shouldn\’t have approved the bike boxes. I agree with you Ryan, that sharrows are a much better treatment for cyclists, yet Burchfield has been exposed now as having this perplexing double standard with regard to sharrows vs. bike boxes. It would appear to me that the City is now focussing all of their efforts on bike facilities that attempt (mostly unsuccessfully, IMO) to physically separate motorists and cyclists, rather than treating them both as vehicles and instituting an education campaign focusing on fostering mutual cooperation on the roads, rather than physical separation. I can understand why some PDOT planners are enamored of Amsterdam\’s facilities, but highly doubt that implementation of similar facilities in Portland will work on any but the most limited scale. Thanks for the response, Conrad. …and please don\’t misunderstand me. I wasn\’t trying to debate anyone\’s credentials. As far as I know, I don\’t know any licensed traffic engineers and I thought I\’d see if you were for interest\’s sake. Very interesting regarding the Sharrows vs. Bike Box thing… hmmmm…. There are many too-narrow-to-install-bike-lanes but nevertheless heavily used cycling routes in inner Portland that would clearly benefit from sharrows, and the message they send to motorists that cyclists are allowed to operate in the full lane. The clearest example that comes to mind is East 28th from Stark to Broadway, a north-south connector which crosses the Banfield. Hawthorne Blvd. also comes to mind (the two way segment from 12th to 39th), as does the East 11th and 12th couplet. Sharrows could also be used to close small gaps in the bikeway network such as SE 26th from Division to Taggart, and could also be used as a sort of bicycle crossing marking for difficult crossings, like SE Clinton at SE 11th and 12th. I simply cannot understand what such a potentially good tool is being ignored and even actively thwarted in it\’s use and application by Burchfield and PDOT. The separation of bicycle and motor traffic is far more limiting than I think most people realize. After all, it pretty much ends at every driveway and city block. The only separation that is actually occurring is that of the parallel paths of bicycle and motor vehicle traffic. This kind of separation creates non-standard traffic conflicts that normally would require either spacial or time separation at each crossing with motor vehicle traffic (in the former, expensive, complicated overpasses for cyclists\’ left turns and motorists right turns; in the latter, expensive vehicle-specific traffic signals such as the Dutch practice, which decrease total traffic throughput by introducing more delays). 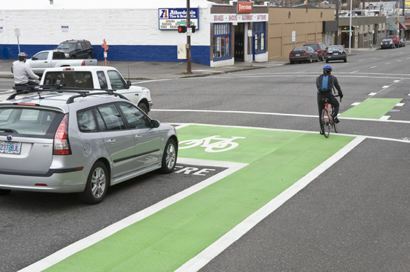 The Oregon bike lane law answer is requiring motorists to yield to bicyclists in bike lanes. This is not based on standard ROW principles and the concept of yielding is not that cut-and-dry; Bob Shanteau stated on his blog that there is no name in traffic engineering for designing for vehicles to traverse lanes rather than merging and then turning. In some situations, it demands that the motorist do more than is humanly possible, which is observing cross traffic at the intersection while attempting to yield to overtaking bicycle traffic coming from behind. That would require having eyes on the back of your head to simultaneously observe all the traffic conflicts. I think in most situation it is possible, usually the motorist has to stop in the right traffic lane and wait for bicycle traffic to overtake, or cyclists have to stagger themselves to stay out of the motorists\’ blind spots. If motorists aren\’t thinking consciously about these non-standard ROW laws, accidents can occur. In most cases is disrupts traffic flow; the few times I drive a car, I find that bike lanes make right turns more difficult, I usually merge into the bike lane before turning, which is of course illegal. I\’ve never been to Amsterdam, but I\’ve read a fair amount about their bikeway network. They extensively use sidepaths, which about 30 years ago were conclusively shown to be the most dangerous bicycle facilities according to U.S. data (car-bike collision data and analysis of their operation). The AASHTO guide warns specifically about them and their dangers, and historically states (although not Oregon) have repealed mandatory sidepath laws to avoid getting sued by cyclists injured in car-bike collisions. I\’ve heard Amsterdam (and other Dutch cities) is very flat and their bicycle traffic very slow. I would guess this is probably why they get away with otherwise very dangerous bikeway designs. I\’ve also heard that driving is so difficult in their old, almost medieval cities that cycling competes with walking, whereas in the U.S. with faster, more convenient driving, cycling competes with private car use. I think this fact coupled with Portland\’s hilly topography and higher cycling speeds in the DT area will greatly limit the amount of \”separation\” of bicycle and motor vehicle traffic. The artificial separation that bike lanes create I think doesn\’t become obvious to people until you ride on busy arterial roads with bike lanes. I\’ve ridden on Pac. Hwy. going from Barbur to Tigard during rush hour (don\’t tell me this is dangerous, it\’s perfectly safe if you know what you\’re doing), and from about the I-5 overpass (where Barbur turns into Pac Hwy.) to about the 217 overpass, I\’m riding in the left traffic lane. The vehicular cycling technique is to pretend the bike lane stripe isn\’t there (which many people misunderstand as \”not riding in bike lanes\”). As I catch up to traffic in the right lane, I merge with that lane, rather than following that tempting clear bike lane and overtaking on the right. If I want to overtake the traffic in the right lane, I merge into the left lane and proceed with that traffic stream. As that traffic speeds up, I merge back right, then back into the bike lane as traffic in the right lane speeds up. It feels a little strange (I\’m sure it looks strange to motorists), but attempting to overtake in the bike lane would be suicide, the amount of right-turning traffic is simply too much to handle. Even when I\’m riding slower than traffic I have to watch out for cars swinging sharply across the bike lane stripe and cars pulling up into the bike lane from side streets (probably because they know no cars drive in the bike lane). There\’s also the trash that accumulates in the bike lane. It took me a while to learn this, but the unhappy experience I\’ve had with attempting to overtake on the right (only close calls, no actual accidents) and the number of cyclists I\’ve known that have been right-hooked or left-crossed while overtaking in bike lanes has convinced me this is the only safe way to get around. Bike lanes definitely don\’t \”separate\” me from traffic, not in any way that\’s to my benefit. This is also exactly why I want to see Oregon\’s mandatory bike lane law repealed. This is a very dangerous idea. If it can\’t be explained easily, drivers and cyclists will not be able to use this system. 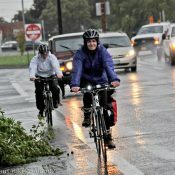 Drivers and cyclists should share lanes. It is illegal in many states for drivers to make a right hook turn. You are supposed to start turning right well-ahead to the corner. I think this is the reason there are so many accidents here between drivers and cyclists. Also, many cyclists make very unsafe lane changes when turning left such as riding straight across multiple lanes instead of gradually changing lanes ahead of time. Illegal moves by a driver of an automobile and a cyclist have different consequences. I don\’t need to point out that a driver has a lot of metal to protect him but the cyclist is fully exposed. Therefore, one has to be survival oriented. Remember, it is better to be uninjured/alive than right.